ICEBAR Oslo by ICEHOTEL gives an experience that will chill you to your bones. It’s made of large blocks of ice from the Torne River in Jukkasjärvi, Finland Sweden (thanks Mrs. Lifecruiser, for the correction!) which helps to give the bar its uniqueness and special expressions. Total bar area is a total of 500 square meters, making it the world’s largest Icebar by ICEHOTEL. It’s built of nearly 60 tons of ice, and the “cold” part of the bar is 100 square meters. Inside the bar it is – 5 ° C all year long, and thanks to energy-efficient LED-light bulbs the ice doesn’t melt even with lots of indoor lighting. The light goes in numerous tones of blue and green, reminiscent of the aurora when it hit the crystal clear ice. 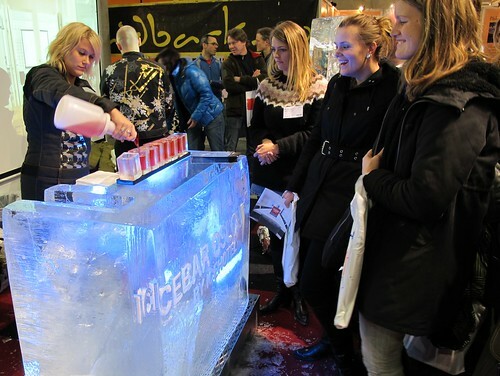 Stine serving ice cold drinks at Norway Travel Fair 2010. Planning for the Oslo Blog Gathering, of course I had a special talk with their Booking Manager, Stine (serving drinks in ice glasses in the pics) and explained about OsloBG. She was excited to hear about bloggers from all over the world meeting up in Oslo this August and of course would love to see a group of us at her bar during the gathering. She explained that guests arrive in this ice area in groups of 60 and are in the ice bar for 45 minutes at a time. Before and after the stay in the cold section, guests can enjoy good food and drink in a “warm” part of the complex. The ice bar provides special clothing to keep you warm in the bar, so you do not have to pack a parka if you will be joining us in August. DianeCA and I will most likely be making it part of our agenda at OsloBG (click to read the official program site) after enjoying the long summer night in a park, and those who are interested can join us for a unique experience! What do you think, sound like fun? I’d need several drinks to stay warm in there. I think I’ll opt for the warm stop and bypass this freezing cold spot. Bring on the drinks and great food. Is this is the eternal drinks that gives eternal life? You really must must must visit the Ice Hotel in Jukkasjärvi one day.. it’s just amazing! Make sure you sleep over in one of their rooms. The ICEBAR is an amazing experience! Sipping your drink from a glass of solid ice is great fun and 45 minutes is more than enough time due to the extreme temp. Oslo is so lucky to have one right on it’s doorstep in the centre of the city. Others are n London, Tokyo, Copenhagen… what a treat for the Blogfest Visitors!!! Very interesting and quite an experience! I never get drunk in an igloo! As I read, one drink will not go hot. Another thing that my husband tells me about the reunion of bloggers is that you will drive you wild with many women who attend the meeting. My husband tells me we’re a danger! Woman together its danger for Oslo ! Despite it looks very frosty, it looks so warmth as well. We have not been there yet, but are looking forward to OsloBG, when we can be tourists in our home town. btw. See on Feb 10? At the this of the year, we also have plenty of ice: the Winterlude festival is set to start next week! Usually, we have ice sculptures, an ice bar etc. for a few weeks downtown Ottawa. I heard there was an Ice Bar somewhere ,if there is more than 1, what is the most popular ice bar/club? And could you recommend some places/pubs to visit around then at night time. Oh wow – how unique! That’s exciting Renny, I’m looking forward to this, it’s getting more exciting by the day! Can you drink it !!!!!!!!!! Very interesting and great experience indeed! This ice bar will be fascinating as the ice is obtained from a natural source. I wish to visit Icehotel one day! looks really impressive! Yes, it sounds like fun! I’m fascinated with the concept of ice bars and ice hotels, which is odd, because I’m one of those people who is always cold. Maybe the alcohol will warm me? I can’t wait to visit the icebar in Oslo but before I must drink something to keep the good temperature! A warm wine for exemple!!! Nice to learn the bat provides warm clothes! I won’t have to put my snowjacket in my bag next august!!! What an interesting concept, Renny. At least we don’t have to sit on “ice stools?…now that could be a chilling experience! I’m excited about coming to Oslo but not so sure about the ice bar. I have lived for decades in the US but still can’t drink ice water – I always ask for water with 1 ice cube. In France they serve Coca-Cola “fresh” and if you ask for ice sometimes they ask you how many ice cubes you wish – I usually say 3. So, ice bars? Hummm…. good luck guys!have fun and continue the connection! I heard there was an Ice Bar somewhere ,if there is more than 1, what is the most popular ice bar/club?? Hi everyone :) Just wanted to say I hope you all visit us in august! We are adding a new floor to our bar experience, with meeting/conferences/special events in mind. So just let us know if there is anything we can do for you :) Perhaps you need somewhere to host your gathering? Nowadays there are number of ice bars around the world like London, Alaska, Canada, and Poland etc. It’s different experience.